Don’t let the “2” at the end of the title mislead you into thinking that it’s a sequel. This is an anime based on the second installment of the Devil Survivor video game franchise. 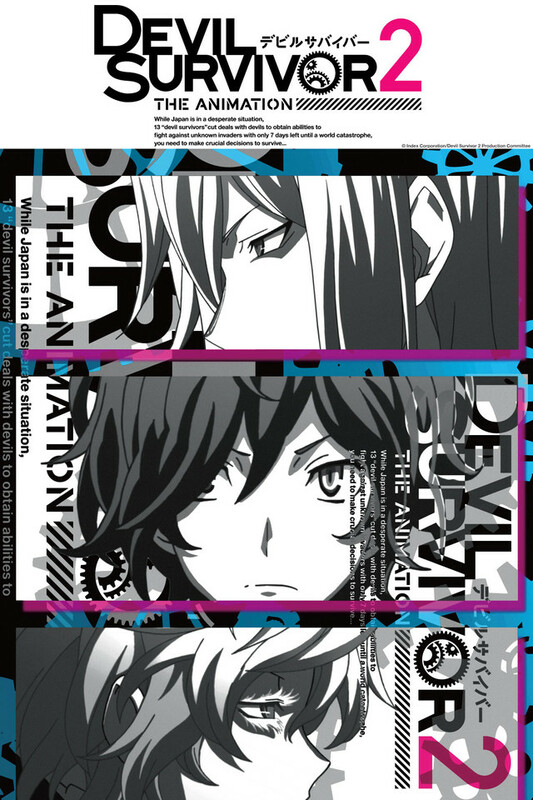 Since the first Devil Survivor had different characters, Atlus and Bridge made the distinction that this anime series was about the characters from Devil Survivor 2, the game. But how did Devil Survivor 2 stack up as an anime? Read on to find out!! Basically, it’s like Yu-Gi-Oh! meets Neon Genesis Evangelion in an app. And I’m OK with that. With countless apps being spawned every day, is it so hard to believe that one would be a gag app that showed you how your friends died? We already have plenty of Facebook interfacing websites that either forecast how you’re going to die, the date you’ll die, or what Disney Princess you are. The Nicaea Dead Face app takes this concept to the next level, showing you a quick video of how your friend will die, once a death flag is triggered in real life. Unlike Candy Crush Saga, this app turns out to be a little too real. Daichi and Hibiki receive a Death Face video of them dying in a tragic subway accident which happens just a few moments later. Before they pass on, they are given the option: Live or Die. When they choose to survive, they awaken to a city on the brink of destruction and gain the ability to summon demons through the Nicaea app. Their cell phones become their weapons as summoners. Daichi, Hibiki, and their new friend, Io, are thrust into a Darwinesque nightmare where they are forced to defend Japan (and, thus, the world) from Septentrion invaders by summoning demons of their own. It’s hot monster on monster action with Chinese legends like Byakuya and Suzaku making regular appearances. Devil Survivor 2 clocks in at 13 episodes and each episode covers roughly one day in the post-apocalyptic world, following Daichi and his friends as they learn more about the app, mankind, a secret government organization called JPs, a prophecy, and the trials facing the human race. Though the time-tested premise may seem a little redundant, Devil Survivor 2 is unique in its execution. Other anime titles with similar themes take around 26 episodes plus movies and OVAs to finish their story. Devil Survivor 2 has engaging fight scenes and minimal descriptive dialogue that would take away from what’s actually happening on the screen and it looks great while doing it. It’s a flashy series with substance. It poses questions and situations to which there are no easy or clear cut answers, forcing its characters to think on their feet. Fortunately, Daichi is mentally well-equipped to handle these sorts of questions while still fighting. He’s an intelligent lead who’s passionate about his beliefs. He’s not afraid to challenge authority and is classy while doing it. The remaining characters are fairly standard archetypes: the plucky side-kick, the beautiful and sensual female, the loud-mouthed younger girl, the strong silent type, etc. Maybe the supporting cast could have used a little more love and development, but the story wasn’t necessarily about them. It was about asking and answering questions that were bigger than the supporting characters’ stories. At the same time, the story was about the little guys. It was about the people who enjoy the ordinary things and why those things are worth preserving and protecting. I particularly enjoyed the small glimpses into Daichi’s past. These small pieces of Daichi’s past kept playing in the back of my mind whenever Daichi made an important decision. I didn’t need Daichi telling me (or anyone else) why he was making the decisions he was making. Just knowing that little piece of his history was enough. For me, the visual effects and music made the series memorable and gripping. Maybe I just love all the electric blue colors that look so radiant on a black background as they flash around my living room at 2:00 a.m. It’s definitely a flashy series. The intro and outro music have been on my playlist for the past year. They’re enjoyable on their own. When you watch Devil Survivor 2, watch the full episode. Sometimes, there is more story content after the ending. Sometimes there’s no ending at all!